Resort Glamping Canonici di Venezia, Luxury camping in the countryside. Our passion for travelling to places where nature is still unspoilt anchors together elegance with unconventional, refined ingredients have led us to give life to this new form of hospitality (glamour+camping) previously unknown in Italy and has obtained an immediate success. 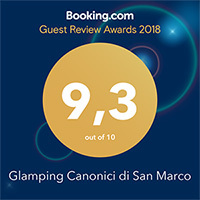 Built In via Canonici of San Marco ( from which it took its name) the Glamping Canonici in 2014 found a beautiful new location still in Mirano, a magnificent seventeenth century barn that offers stunning historical settings. Immersed in the peaceful country side that stretches between the Venetian lagoon and the Brenta River, where the Doges and ancient, noble venetian families had their summer homes. The new headquarters is in via accoppe fratte , surrounded by cornfields and orchards that mixes the tradition of the place and pleasure to live closer to nature by sleeping in splendid and spacious tents equipped with those comforts that indulge relax. Everything is created from fun and passion, from the desire to give “ a new life” and a new context to all those objects Brought from long journeys or found in flea markets or preserved with great love by the attic cleaning grandmother. We have seen these objects in a different perspective, as a chance to revive our past through new inspirations, where the armchair, bored of being in the living room gets moved into the bathroom, where the suitcase worn out from travels becomes a table. We have given room to everything and we found in the GLAMPING a suitable context for rebirth, in an atmosphere out of the normalities for those everyday objects that are part of our history. Sleeping in a tent, but on a comfortable four poster bed as our great grandparents, but in a new context where contact with nature becomes more direct and real. who published an article on the best glamping in Europe, by entering the GLAMPING CANONICI In the top ten shortlist. This article has aroused interest of many other newspapers who have considered the unusual hospitality that we offer. That was how the “first glamping “ in Italy was born. The need for contact with nature is becoming the determining factor in the choice of place for the Millennium traveller fleeing from urban centres that are more cemented and suffocating, they wish to spend their holidays or even short weekends away from daily routine. Undertaking rich and authentic travelling experiences but with a 5 star facilities. The glamping is proposed as eco / sustainable tourism that can satisfy this need to get back in touch with nature. Creates atmospheres that allows you to experience how it changes our perception when there are no televisions or phones to absorb our attention. Atmospheres that helps find that inner peace that only the contact with nature can generate. The Glamping uses ecostrutture, that is “structures that have zero impart on the environment, perfectly integrated into the environment, ecological and eco friendly but with comfortable, luxurious refined furnitures that are always inspired by environmental criterias. ECOLOGY & DESIGN, Concepts that until recently were mutually excluded, today find their expression in luxury campsites combining the taste of a holiday in touch with nature to the benefits of room and service or rather “tents “, equal to those of multi stars hotels. A study done by one of the most important stakeholders (G.HNET ) shows that touristic glamping attracts a genetically well defined eco-educated, non standard and therefore enterprising and curious,individual. It is form of “word of mouth” being wary of touristic packages, detests crowds and searches for nature, landscapes and low density areas of human settlement. Are you acknowledged as glampers? Emanuela, Monica and all the staffs are waiting for you for an unforgettable experience!